Design studio Think Forward developed SALGHT, an art installation that explores the interaction between salt and light, and the qualities of salt as a product design material. Designed specifically for the Bulgarian city Burgas’ “Festival of Salt,” SALGHT explores the different uses for the region’s cheap and abundant salt. When combined with resin, salt becomes waterproof, relatively load bearing, translucent, resistant to water, greases, oil, and does not crumble. 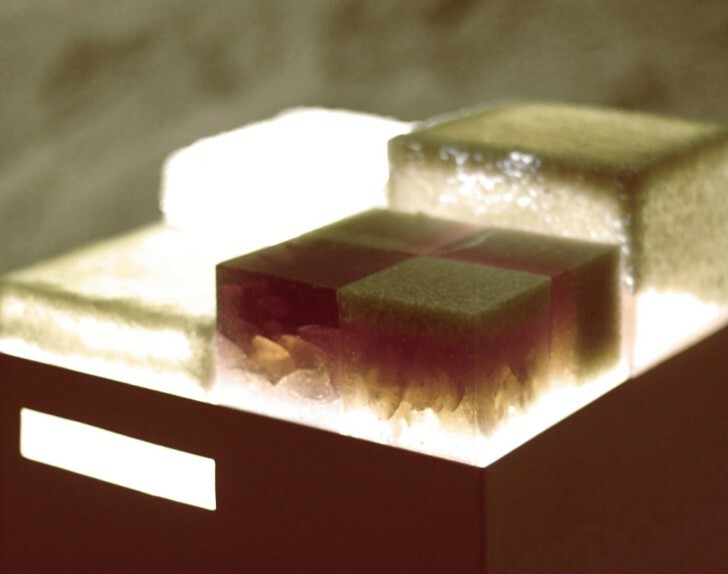 Therefore, Think Forward combined those two substances in the SALGHT installation, which consists of the 4 samples – a massive cube (20% salt, 80% resin), a thin-walled resin+salt FLEUR DE SEL cube, a thin-walled resin+coarse salt cube, and a glass cube covered with an Egyptian salt+resin substance. Design studio Think Forward developed SALGHT, an art installation that explores the interaction between salt and light, and the qualities of salt as a product design material. Designed specifically for the Bulgarian city Burgas' “Festival of Salt," SALGHT explores the different uses for the region's cheap and abundant salt. When combined with resin, salt becomes waterproof, relatively load bearing, translucent, resistant to water, greases, oil, and does not crumble. Therefore, Think Forward combined those two substances in the SALGHT installation, which consists of the 4 samples - a massive cube (20% salt, 80% resin), a thin-walled resin+salt FLEUR DE SEL cube, a thin-walled resin+coarse salt cube, and a glass cube covered with an Egyptian salt+resin substance.